Product Key Decryptor: Recover License CD Keys of over 200 popular softwares including Windows, Office, Adobe etc. 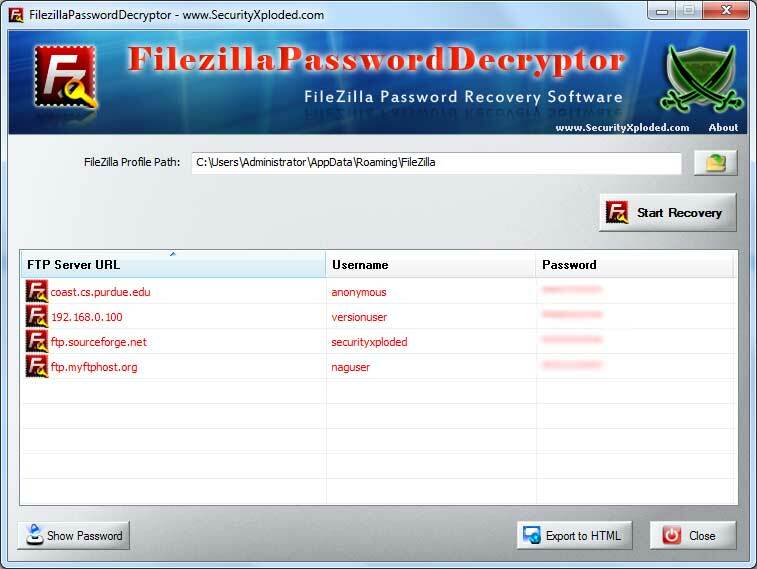 CuteFTP Password Decryptor is the FREE software to instantly recover FTP login passwords from CuteFTP software - popular FTP client application. CuteFTP stores the password for all the past FTP sessions in user profile location so that user don't have to enter it every time. CuteFTP Password Decryptor makes it easy to quickly scan & recover all these stored FTP login passwords. CuteFTP Password Decryptor works on all the platforms starting from Windows XP to latest operating system, Windows 10 version. Instantly scan and recover all stored FTP login passwords from CuteFTP. Useful for IT Administrators, Penetration testers as well as Forensic investigators. CuteFTP Password Decryptor comes with Installer so that you can install it locally on your system for regular usage. It has intuitive setup wizard which guides you through series of steps in completion of installation. Launch CuteFTP Password Decryptor after completion of installation. 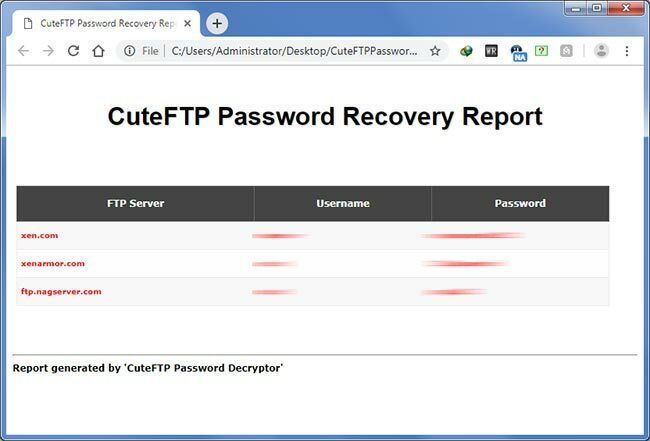 Next click on 'Start Recovery' button and all ftp login passwords stored by CuteFTP will be recovered & displayed as shown in screenshot 1 below. Finally you can save all recovered password list to HTML/CSV file by clicking on 'Report' button and then select the type of file from the drop down box of 'Save File Dialog'. 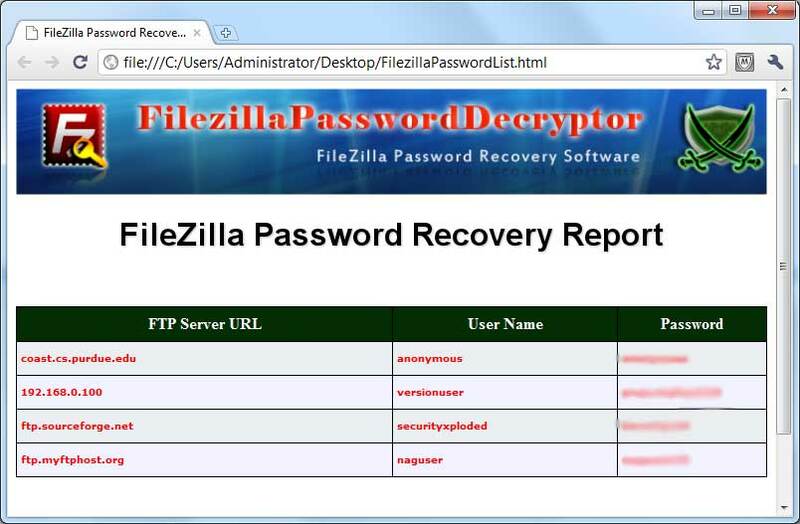 Screenshot 1: CuteFTP Password Decryptor is showing the recovered FTP login passwords. 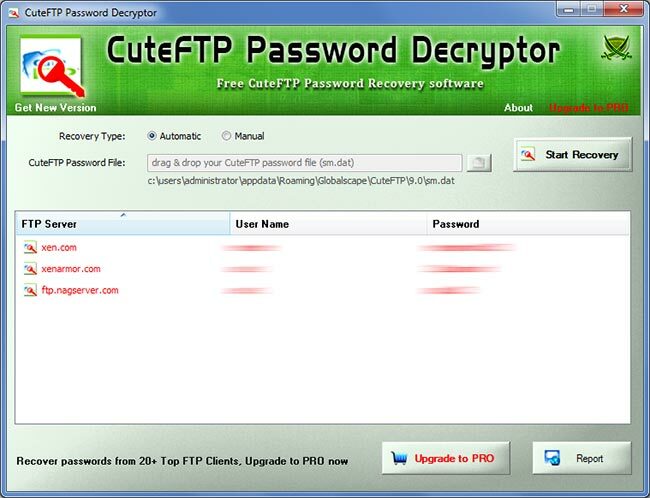 CuteFTP Password Decryptor is not a hacking tool as it can recover only your stored passwords. It cannot recover the passwords for other users unless you have right credentials. Like any tool its use either good or bad, depends upon the user who uses it. However Author or SecurityXploded is not responsible for any damage caused due to misuse of this tool.